The arrangement, movement and energy of the particles in each of the three states of matter: solid, liquid and gas. Solid: Particles in a solid are still and have no energy, the particles aren't moving. All of the particles in a solid are touching and are compact. Liquid: Particles in a liquid are moving and can flow to fill and fit a space, the particles have some energy. Like solids, all of the particles are touching. Gas: Particles in a gas move freely and have lots of energy (a high energy level). The particles are far apart aren't touching. An example is carbon dioxide. There is no such thing as liquid carbon dioxide. It turns straight from a solid to a gas at -78 °C. 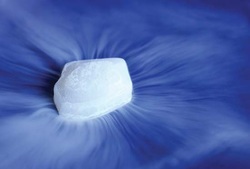 Solid carbon dioxide is known as dry ice. In the image on the left, you can see that solid carbon dioxide turns straight to a gas. The white gas appears because the carbon dioxide produced is so cold that is causes water vapour in the air to condense. Carbon dioxide gas itself is invisible. Changes in arrangement, movement and energy of particles during these interconversions. Get this page improved within 90 minutes! Have an idea? Suggestion? Recommendation? Make changes/additions/deletions to the article, and one of our editors will publish your suggestions if warranted. Every page is updated regularly so use the form below to let us know what's on your mind. We value your feedback and are always anxious to improve your revision. How could this page be improved? Is there any information missing? Leave your comments here.